A few years ago I purchased a Canon G1X, a large sensor compact camera. I was very pleased with its image quality and enjoyed its portability. After I gave it as a gift, I found another one on eBay and purchased it. Recently I received as a gift the new and improved Canon G1X Mark II. In the last three weeks or so, I have been photographing with it whenever possible. The first round of photographs was around the house and in the garden, and of course a willing subject Pasha, our miniature Schnauzer. The camera has several improvements and a few other things that need further work. This post is not a review of the camera but about my experiences with it and what features I like and what features don’t work as well. So, if something is omitted don’t think that it was due to an oversight; I might not use that feature or nothing noteworthy about it from my usage perspective. The body is now a little smaller and with cleaner lines. The small size also comes with a drawback that holding it is not as comfortable as the original G1X. With the electronic viewfinder attached, the bulk of the camera may be a little bigger than the former model. Although the EVF is removable it is not as convenient as one may think to carry it in your pocket. I do like the EVF though since I find shooting with stretched arms looking into the viewing screen a little awkward. Call me a traditionalist but I like holding the camera to my eye. Even with the original G1X, I used its optical viewfinder despite the fact that it did not show the full capture. I like the new rings around the lens barrel, especially the ability to program the assigned functions. The step zoom function was a feature in the original and I was happy to see that I could assign it to one of the rings. However, for some reason I cannot explain, the firmware does not allow me to assign the step zoom function to the inner ring in all shooting modes. That would be a welcome feature if a firmware could take care of that. I would like to program the ring and forget about it. Now, I need to remember that in some shooting modes that ring does something totally different. The built-in flash works fine with an undocumented feature. Since it pops up on an articulated joint, I can gently pull it back to point it upwards or to an in-between angle. I realize that it will lose some power but for some subjects, it will be a very handy feature. Just be careful when you pull it backward! The picture quality is very good, I will share three collections with you below and you will see them for yourselves. At times I have difficulty in getting sharply focused photographs but so far I have attributed that to my ability to hold it steady. I have checked to make sure the Servo Focus was not turned on, it is not. The battery life was documented elsewhere and I can attest to that, it could be a little longer lasting. I don’t quite understand the reason to change the battery every time a new camera is designed. Why could the camera manufacturers not establish a few standard sizes and stick with that? Oh, well … While on the subject of standards, I also do not understand why the bottom plate configuration changes that frequently as well. Moving the tripod screw hole screws us up as each new body needing a new Arca-Swiss type plate. There is not even a plate for this camera from any one of the providers, like Really Right Stuff, or Kirk Photo. We went to the Buttonwood Farms where they raise sunflowers for their cattle. It is a nice scene but does not change from year to year. So, I took a few photographs, like the one with a fly on the upper leaf and a group of sunflowers seemingly in a state of confusion, not knowing which direction to turn their heads. But the real find was on the way back when we made a pit stop. 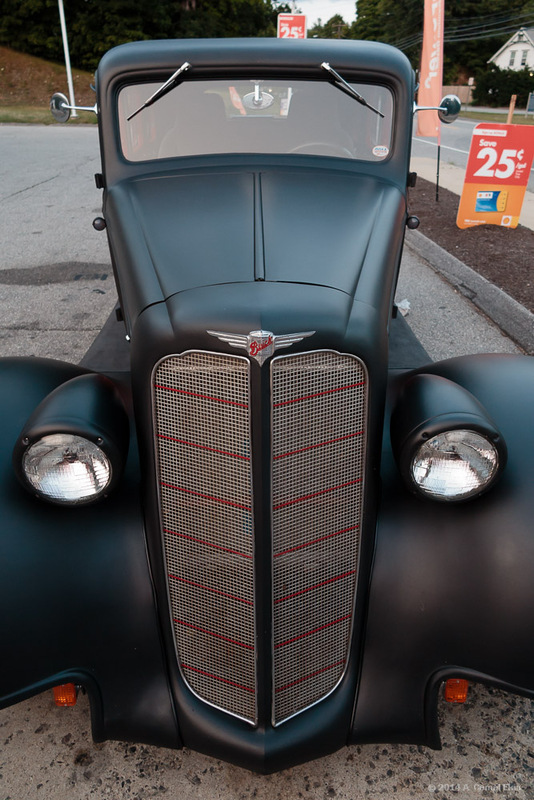 At the gas station were two hot-rod cars restored and beefed up with remarkable restraint. Enjoy the Buick and the Chevy. If you are wondering why I took the window blinds photograph, part of the reason is in the title. The other part is that not everything in life is as tidy as we think they are, the tilt signifies that to me.